Thomas Jefferson’s lacrosse team had a very successful season full of hard fought games. Another year, another season, and the Thomas Jefferson lacrosse team came back bigger than ever. This year, the lacrosse team’s schedule was packed with big schools and big competition to push the team’s limits and help them improve. Although there are many returning players, like four senior captains Alex Tate, Corbett Tate, Samson Johnson, and Evan Domagala, the team welcomed many new freshmen who added depth and skill to the team. Alex Tate felt as though this year their success relied on the “talented young group of student athletes that have an established bond,” a bond that was visible on and off the field. Through hard work and dedication, the athletes have progressed both individually and as a team. On the field, the team played by the phrase “never satisfied.” To the team this quote mean no matter what happened on the field or what the scoreboard said, there will always be room for improvement. This motto encouraged the team to strive for the best, not only as a team, but individually as well. The team worked hard this season with an ending record of 10-4, and a chance to achieve even higher in playoffs. Heading into playoffs, the team has played against the very best, including the reigning Colorado state champions Valor Christian, as well as many 5A schools to prepare them for the potential competition in playoffs. Head coach Jason Klimczak mentioned that the group of kids that came out for the season is what excited him most this year. This is Klimczak’s third year coaching at TJ with a lot returning players that have similar mindsets to reach the goals the team has set since last year. Klimczak sees the entire team putting in the time and effort to progress their talents and to achieve their goals. 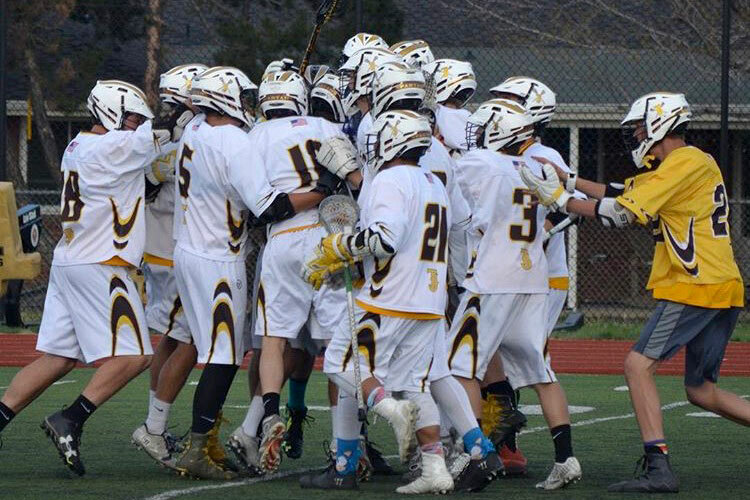 Having a dedicated coach as well as a dedicated team is one thing that sets the TJ lacrosse team apart from many of the other 4A schools in Colorado. The team persevered this entire 2016-2017 season in hopes to make it to playoffs and be successful. Although the competition throughout this season was fierce, and the hours put in due to the long practices were hard, the team proved itself yet again to the TJ community and other teams who may have doubted them. Congratulations to the boys who participated this season; the Spartan community looks forward to another great season next year.